Lectures: Roy Ascott, Vicente Matallana, Laura Gracia. Digital Analogy is an exhibition that explores the computer code and artistic practices that were a fundamental influence on the development of the creative and interactive processes that are a vital component of everyday interaction in today's society. The contemporary artists who are taking part in this exhibition are responsible for pioneering processes and innovations that we use regularly to communicate research, ideas and ideology. At the time that this group of innovators created these electronic artworks, what we recognise as "digital art" did not exist. Approximately four decades ago we had the ideas and philosophical frameworks to develop the complex platforms that we have integrated within diverse social networks, but it was thanks to the contributions of these artists in the field of art, rather than technologists as such, that these concepts became the constituent bases of what nowadays is understood as new media. This exhibition explores diverse discourses such as artistic, social and computer science to understand the evolution of this New Media Art. Examination of these approaches will help us understand some philosophical and technological considerations that were brought to the field of art, and subsequently will enable us to comprehend the intentional origins of these concepts. For example, “Telematics” enabled important developments such as the mobile communication and some of the intuitive devices that surround us nowadays. This was possible due to the revolutionary and innovative thinking of pioneers like British Professor Roy Ascot and artist Casey Reas who initially produced generative art forms being the co-creator of Processing that is a programming language, development environment, and online community. This exhibition incorporates video installations, mapping projections and site-specific interventions; in a layout that seeks to rethink concepts such as "progress and development". Digital Analogy is an exhibition that will allow us to observe closely the formal structures of these works and also generate dialogue about the research from which those theories have arisen. In this exhibition the innovation comes from philosophical interpretations of technology and programming codes as poetical resources rather than being seen only as a practical tools; which in the contemporary world are part of our regular basis activities and also the most advanced forms distributing knowledge. Working and interacting with other communities has become one of the most important channels to generate knowledge transfer, therefore inviting artist who have been working on the foundational bases of this subjects might allow us to see the behind the scenes of Media Art. For this reason this exhibition examines some specific artworks of electronic arts, as this group of creations will illustrate a fragment of the history of the electronic and digital arts, and this initiative will provide the Bogotá’s audience the outstanding works of the pioneers of New Media, a term that in turn is mediated by the flow of information and its subsequent computer hybridization. Lectures by Roy ASCOTT, Vicente MATALLANA, Laura GRACIA. Workshops by Laura GRACIA, Michael KARGL, Jorn EBNER. Surveillance is a French term adopted to design the state of control through video-cameras. Videosurveillance appears late on the 1980’s and is strongly criticised for the Social Sciences studies because it is used for security practices against human rights and loss of privacy. Manu Luksch, Harun Farocki or Igor Stromajer develop strategies to improve and reformulate these practices with electronic technologies. There are also practices of surveillance in the Internet. Cybersurveillance includes other practices as Cyberactivism and Cybersecurity. It is known that agencies, programs and enterprises have been developed during the last the century to contribute to cyberwar & netwarattacks. Free media, independent journalist, hackers, hacktivist and activist are suspected as cyberattackers. Artists such Paolo Cirio, Konrad Becker, Fran Illich, Etoy, Ubermorgen, Julian Oliver, Danja Vasilev, work with free media and hacking strategies to denounce abuse of power and acts against human rights. Resembling policies of terror, Cybersurveillance leads with terrorism. In that sense, Wikileaks publishes information about war and cyberwar. It is continually prosecuted by state agents. Julian Assange, Edward Snowden and Bradly Manning are suspicious figures of the contemporary Geopolitics. Finally, the Intellectual property laws have been seriously injured by state cultural agents under internet surveillance laws and committees for security repressing artists, writers and journalist. The videosurveillance is streamed in real time through the use and operation of surveillance systems and CCTV television circuits. Quoting Slavoj Zizek, videosurveillance systems are a persistent threat to privacy. The control is there to guarantee a normative and a social order. The images of videosurveillance do not have a neutral meaning. These are images that spread the fear and legitimate the control. Moreover, according practices of control, the sentence ¿Quis custodiet ipsos custodet? (¿Who will watch the watchers?) also refers to the study of surveillance systems. Some of the cameras are not secure or perfect and part of the content is distributed through Internet turning into a threat for privacy. An innumerable number of liveapplet exist in the internet giving access to private and public webcams (online community cameras, IP cameras without passwords, Dorks or public cameras). Manu Luksch is an intermedia artist whose practice interrogates conceptions of progress through the devising of tools and frameworks and the instigation of processes. With a strong emphasis on research and dissemination her recent work address to surveillance, corporate data harvesting and the regulation of public space. Manu Luksch has participated at the AEC Ars Electronica Centre, Linz, at the exhibition “Out of Control – What the web knows about you”. An exhibition about digital identity, captured data, telecommunications data retention, security, privacy, phishing and more items regarding videosurveillance and cybersurveillance. Igor Stromajer is a media artist from Slovenia who introduces changes in political and cultural structures to declare failure and error of the systems. He uses to work with new technologies and new media such optical devices, robots and internet. His work is represented in the website intima.org. Igor Stromajer establishes practices of counter-power, where political subject and major forces of social development are hacked to produce a change in the system. Tactics of resistance are used to be inserted in opera buildings, town halls and other civil and common places where the social order is distorted. On the other hand, artists, activist and hackers developed policies for human rights. Paolo Cirio, Konrad Becker, Fran Ilich are promoting free information platforms, newspapers, online radios, networks and databases. Most of them developed with free-open software, following creative commons ideology against Intellectual property, supporting the free internet movement and defending social rights and free media, they are also against capitalism. They struggle for a new economic and social order. Most of these practices consider internet as a freedom space. The cyberspace is taken by artist as a tool to develop social structures for communication to improve its social relations. According human rights, heritage and preservation policies, artists build softwares, internet platforms and network devices that are offering a different points of view from those of the politics, military and abusive practices. Since the emergence of cyberspace, artists have created networked practices. The freedom of the cyberspace has been affronted as a public space. This concept has a very important connotation for the development of democracy. And since the end of the 2nd World War in Europe, the emergence of the leftist thought referring to philosophers as Adorno and Hannah Arendt have contributed to edify the perspective for a new social practices and relations with the citizens. The same connotation - public space - has been introduced in the cyberspace and internet. In its claim for freedom and internet uses for personal and social development, the cybermanifests claimed to promote the defence and rights for free internet as a platform for work. Hackim Bey published in 1985-1991, T.A.Z. The Temporary Autonomous Zones, in Autonomedia. The references to imaginary geography and the fictional description of spaces that the artists use to develop the idea of an egalitarian society is a path to understand what the cyberspace is. The emergence of the net.art in America contributed to the writing of manifestos: The Cyphernomicon and The Crypto Anarchist Manifesto by Timothy C. May, and A Declaration of the Independence of Cyberspace by John Perry Barlow. The Cyphernomicon was written in 1994 by Timothy C. May. It is about the Cypherpunks, a group that have existed since September, 1992. Artists are using cryptography, searching key escrow, ciphering the Net and the Information Superhighway. Forces of power finally consider them as cyberterrorists. They use the cryptoanarchy against security and control, for freedom, free sources and knowledge. The Crypto Anarchist Manifesto is addressed to all Cypherpunks, those “physical Cypherpunks” that in Silicon Valley requested some of the material to be available electronically for its entire readership. The Crypto Anarchist Manifesto date was back to mid-1988 and was distributed to some like-minded techno-anarchists at the "Crypto '88" conference and then again at the "Hackers Conference". A Declaration of the Independence of Cyberspace by John Perry Barlow was declared against Governments of the Industrial World, those who are giants of flesh and steel. It says: “I come from Cyberspace, the new home of Mind. On behalf of the future, I ask you of the past to leave us alone. You are not welcome among us. You have no sovereignty where we gather.” Those are examples of 90’s manifestos. Another important manifesto was written by Gert Lovink, The ABC of Tactical Media, on nettime. Nettime has been used as a common platform for sharing information and free knowledge. Artists, hackers and activist are all considered and threaten as terrorist, under similar laws, control and social prosecution. According to intellectual property, state agents are confronted with CC Creative Commons and Open Source projects. The conditions of production according internet and new publishing softwares make easy the process of distribution – books, albums, films. Regarding property laws and authors rights, it is said that new ideas can be developed thanks to the free and sharing platforms. Publishing under CC, facilitates to the author to distribute and disseminate the clear task of knowledge. In Spain, the Intellectual Property Commission (CPI) is administrated by the Department for Culture. It investigates in collaboration with other organs of the Government, for example the Department for Defence. They have competences in matters of surveillance and the control of Internet. The Law for Economic Sustainability, developed by the Department for Culture under the term of the minister M. Angeles Sinde, during Zapatero’s Government, was created to contribute and develop the internet surveillance. The Intellectual Property Commission (CPI) was created during the same term. It takes charge of the regulation of internet downloads, prosecuting and closing certain webs and sites, controlling the musical industries production or denying access to media communications. It gained a very bad popular reputation, claiming its non-development with multiple demonstrations against it. The Commission has continued its anti-downloads laws and shutting free platforms for films and many more. Users are criminalised according the spectacular industries of cinema and music supported by the SGAE laws and the companies that dominate the cultural industry. In this order, laws of intellectual property are a path to cybersecurity. Open source and free software have the aim to guarantee the universal access to knowledge against multinationals and corporations’ economical reasons to grow them own profit. GNU General Public Licence funded by Richard Stallman develops an open software platform allowing the users a free use of the internet communication tools. Contrary, Microsoft sells all of its products, almost obliging the consumers to acquire the product and the new versions, tending to a capitalist economy of stocks. So, the Free Software movement, the activists, hackers and artist claim for the free use and distribution of the information, for common and collaborative practices, against the property and capitalism, or the abuse of power, control and surveillance. Workshop "Taller de Cibernética Sonora. Teoria de Sistemas"
Introduccion a tecnicas. Teoria y practica. El sonido es uno de estos sistemas que conforma una experiencia de conocimiento de la realidad. El sonido está formado por espectros de frecuencias y su forma ha sido descrita como circular, no-linear, desorganizada, auto-organizada, caótica, indeterminada, aleatoria. Es definido como sistema complejo y dinámico y es interactivo, impredecible, desordenado, azaroso. Critical review: Digital Analogue. Pioneers of New Media. Personally, I suggest a revision around questions such as ethics, deontological code, professionalism, permission and authority in curatorial models and participatory practices in art, science and technology. Regarding the curating model used in the exhibition Digital Analogue, this is not what I do, this is not my curatorial line, this is not my work, and this is not curated by me. Actually, the participatory models of curating new media art have created new structures where to engage curators, theorist and artists in a hybrid form of exhibition, workshop, and live performance. Models that are constantly against the mainstream and the policies of power supported by authority and based within the ego of the artists: elitism and paternalism. Another point to consider is that the exhibition Digital Analogue has a lack of investigation, the research is weak, doesn’t achieve the standards of the experienced d.i.y. artists, the art electronic avant-garde and the art –science – technology experts, curators and artists. There is a lack of coherence, strength and unity. Although is a very good local exhibition and a potential project for the future, it is a very paternalist project, too. We are tired, exhausted and discomforted to defend machismo, we don’t work like this, we have surpassed the borders of curatorial mainstream inside the whitecube, we work local and with deep meaning for life and social contribution. We work and develop with very low budgets and financial support. Art inside the whitecube is not our center or action. We operate in labs, blackboxes and within experiences of life. So, following it can be said that the exhibition has not gone so good. Regarding budgets: Some artists complained because a lack of the organization. Once you have the experience of working with countries in development (Africa, Asia, South-America), is commonly understood that development plans, strategies for events and management are difficult and with very low budgets. 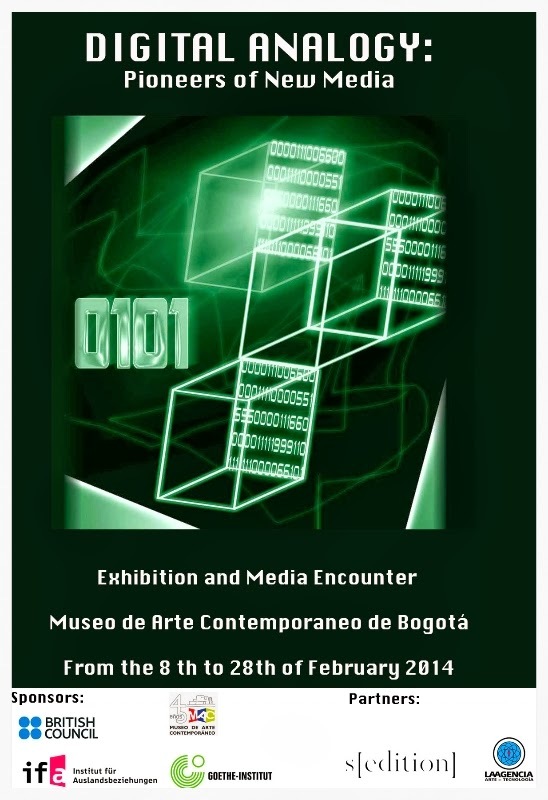 The MAC Museo de Arte Contemporaneo de Bogota has not any budget for the exhibition. The Planetario was also not offering any budget. The financial support comes from the universities, where the artists did the workshops and will be a very tight amount for 2 or 4 hours work. 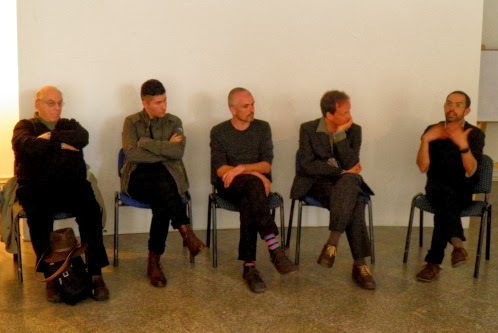 We, the team of artists and I, were expecting to meet the curator in Bogota, but he was not there. Because of an economical reason, he sent an email to the artists and lecturers demanding for financial support to pay transport fees from London. This is very curious, a new methodology, perhaps. If the curator cannot be present in the exhibition has to delegate someone in order to help organization and artists, more directly and improving communications. Andres Burbano, has taken part of the curatorial role and it has been an excellent conductor. I sincerely told him that I was not approving certain practices. Some artists have complained as well regarding communications and expectations. Regarding curating: some participants have commented me if I was the curator. I want to clarify that no, I am not. This lack of professionalism deceives me. Moreover, I must say that a few years ago, in 2011, I wrote an investigation project entitled Language Code. In collaboration with CED – MACBA Museum of Contemporary Art Barcelona, I studied the relations of conceptual art and code art. I did a similar work in the style of Thomas Dreher. Once the research was finished, I asked permission to international artists, local artists from Barcelona, activists and other theorists and curators to work in a public presentation of the Project. The event was one week and hold in Conservas, an underground lab in Barcelona. I was trying to break conventional models of exhibition. It was a workshop, a seminar, an exhibition and a live event with screenings and performance. It also engaged the audiences to participate to create a language artwork based in cut-up projects. Jorn Ebner, Michael Kargl, Roy Ascott, John Angel were presented in Language Code exhibition among a total number of 20 artist more. As a researcher, critic, artist and curator I disapprove some cultural practices and curatorial models. 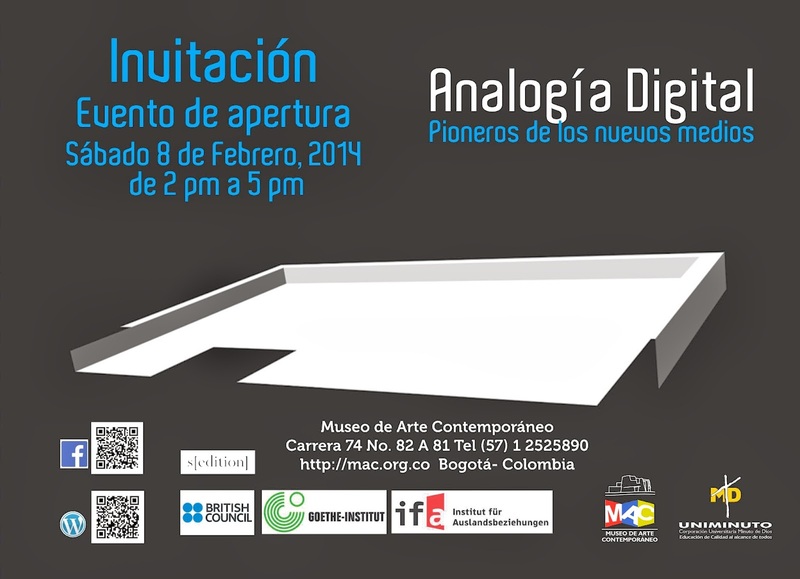 Some artists from Digital Analogue commented and understood that I was curating part of this exhibition in Bogota, because part of my research project from MACBA is also presented in MAC Museum of Contemporary Art Bogota. I have never been asked for permission to use part of the research project I developed. I simply was noticed one month before Christmas and the curator was demanding to participate as a lecturer. According methodologies of curating, there is a new curatorial role based in appropriation. It creates new exhibition strategies. Taking artists’ works without permission or non-demanding artist participation is changing the administrative model of exhibition. Contracts, infrastructure and participation offer a new possibility to engage creation and hopefully create more opportunities for emergent and youth talented unnamed artists. Regarding press, communications and management, the organization was bad; there wasn’t any press dossier with information about exhibition, workshops, and lectures. I think that this is completely required when you are working with artists such Roy Ascott or Michael Kargl. Moreover, I think any project and any artist, any type of artist, deserves a good communication strategy, with the required press dossier and supportive information. Even though there was a catalogue, there was not all the information there. The workshop, the lectures and other supportive artists and lecturers are not presented on it. It supplies biographies and information about the artist and artworks. It pays the same attention to the artists that are exhibiting physically in the exhibition space, as well as the artist in s/edition. This is giving a general false idea about what is the exhibition and is confusing the audiences. This is unbalanced. Regarding the exhibition space distribution, it has to improve. The TV screens are damaging the view of other installations and artworks. Although this, it has to be recognized that the work of Alberto Lezaca is really well installed and exhibited. Congrats! During the montage, there were serious problems regarding printing and materials. Artworks were not well printed and artists should have to use other materials, different from those they asked for. We suggest that the s/edition has to be presented in a loop session, like a screening in a black box cinema. The museum space has it space so it could be a really good solution. It will liberate the exhibition space for the installations and the spectators could enjoy a program of more than 40 minutes videos sitting in a kind of cinema inside a museum space. We suggest that workshops and talks have to be done in the same museum space. The Museum has this equipment. There is a room upstairs where talks and workshops could be done. This will contribute to generate local practices engaging audiences to move there and growing the local circuit. The events program has to be set up in a more comfortable timetable. Regarding content: 1) pioneers. 2) feminism. 3) local/brit artist. There are 6 artists exhibiting physical artworks, 3 local artists and 3 international artists. There are no women. The use of big mainstream names from the s/edition is trying to attract expectations, like a suggestive intention, but really it is a screening loop in two screens. 1) Pioneers. The exhibition title is not corresponding to the goals of the exhibition. It cannot be said that is a pioneer’s exhibition. This is not the case. There are specialized media art historians that will recognize that this is lack and a misunderstanding. “Edward Shanken comes to mind. And in my own University, historian Charissa Terrranova.” says Roger Malina. - 22% of female artists at Documenta X (in 1990s: the 29% in documenta XI, 46% in documenta XII, and back to 38% in documenta XIII). Data by Katy Deepwell, Editor of n.paradoxa. More data about Women in music industry from BBC: Mandy Parnell, mastering engineer of Vampire Weekend and Bjork declares that there is any women in mixing desks, it is thought women are not attracted to the technical side of music, because of electrical engineers implies lots of physics. They rather perform sound. The female participation in social industry or music industry is affected by the evidence of a lack of models. 3) Local artsits / Brit artist. There is a sense that the use of “big names” from s/edition is like an attractive suggestion rather than a matter of history or knowledge, or information. Rather, I think the curator is trying to persuade, giving an illusion of history of media art. I think this is a more commercial and digital project that I am not interested in. I think this is what exactly Baudrillard defined as Simulacra and the tendency in consumerism object to persuade the spectator. I have received many complains and it is thought that is a very paternalist project. And it does not consider the social and actual needs of its country. Marc Garret also commented “On one hand it's because the choice of ‘now’ disreputable ‘BritArt’ artists, and on the other, it's because there is an embarrassing lack of women included in the exhibition. It is not representative of the amazing women in arts and technology who deserve so much better than this”. It is really well received the local collaboration. The artists have a really talented work and the effort and fight with the institutional frame and universities grow and enrich the cultural context of Bogota, an incredible city with massive social disorder and inequalities. Is very important and is a really good to exhibit 3 local artists altogether 3 international artists, this helps cultural practices of Colombia, increases the level of participation of institutions to electronic art or new media practices, and helps emergent artists with good level, quality, interested and professionalism. According this, I have to say that it is super-interesting and thanks to this kind of exhibitions, new models of distributing video- art are developed. It could probably respond to new distribution roles and methodologies of production in new media. Surely, it changes capitalist and economically structures. I remember the editions of Picasso and Dali: thousands of copies resembled millions of millions and investment for art. The videos presented under s/edition are works from Damien Hirst, Casey Reas, Memo Atken, etc... Recently, Alessandro Ludovico has written about new techniques of printing and distributing. This is amazing, but in the case of Digital Analogue the selection result not interesting because from my point of view is supporting commercial and capitalist structures of art as merchandise. According post-marxist discourse it can damage lots of theoretical works done in the area of value and object-hood in contemporary art. We demand live art and live performance to sustain our way of life as artists, developers and creators. I appreciate and consider the effort the curator is doing to realize this exhibition. I have to congratulate his work even though I would curate very differently. I strongly encourage the curatorial team, or the curator, to develop and work and to improve relations within the frame of curatorial practices and cultural management. I always like to support collaboratively practices. I am interested in grow projects, in the deep ontology of art, in good intentions and emotions and in hard-working. Thanks to Marc Garret, Pedro Soler, Tamas Banovich, Anick Bureaud, Ashok Mistry, Bronac Ferran, Sarah Cook, Paul Brown, Roger Malina, Ghislaine Boddington, Vicente Matallana, Joasya Krysa, Andres Burbano.